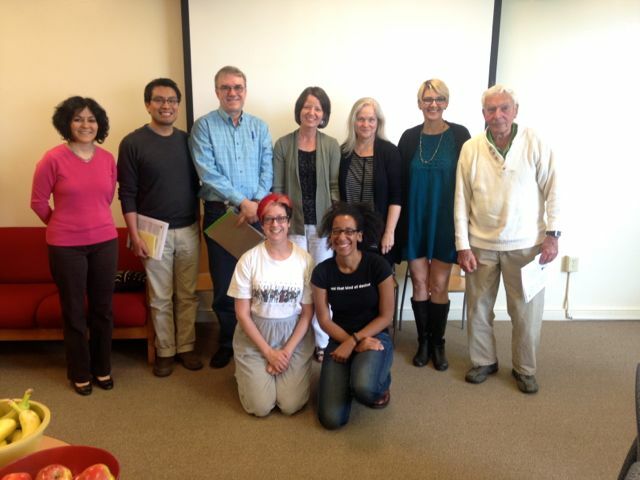 Thursday, December 3rd, was a fabulous day for the German section at Denison University’s Modern Languages Department! The wunderbar string quartet Ethel joined the German social coffee hour to discuss and show via example the influence of revolutionary Austrian composer Arnold Schoenberg on the avant-garde and contemporary composers – including Ethel! Students were enthralled. Evan Woodnorth and Hannah Doermann lead the weekly Kaffeeklatsch, which invites students from all courses and levels of German to join in for conversation and German coffee. Every Thursday during common hour, they discuss contemporary issues such as the refugee crisis in Europe to pop and alternative German music to important historic events. Hannah, who is a native of Bonn, Germany has been co-conducting German KK since her freshman year at Denison and Evan, a native of Minnesota, who is practically linguistically and culturally near-native German after spending a year living in the country right after high school, when he had been awarded the coveted Congress-Bundestag scholarship, has been contributing very creatively to KK for the past year now. Together, they’ve made a great team! On average, Kaffeeklatsch has a student turnout of about 20 students each week in the Foresman Lounge on the third floor of Fellows Hall, but with Ethel visiting we had to move to a larger space than our regular gathering place – almost all students from all courses as well as students interested in “all things German” came to the social hour, about 100 students. All visitors enjoyed German chocolates, ginger breads, and the famous German Stollen with Jacobs Kaffee throughout the event. Beautiful cello artist Dorothy gave a very insightful introduction to the importance on Schoenberg on the American avant-garde and Ralph shared his own experiences with Schoenberg’s genius in his development as a musician from his teenage years. Corin and Kip rounded off the influence of Schoenberg on their own artistic development .. until we ran out of time. Arnold Schönberg’s work and significance as a major cultural figure was a topic in the advanced German course 311, a writing course and survey of 20th century German/Austrian/Swiss writers and artists. For students to get an in-depth exploration of his work with highly recognized musicians such as Ethel is a treat very few college students get to enjoy in such an intimate and close setting. I would like to whole-heartedly thank Mike Morris Sr., Director of the Denison Vail Series, and Ching-Chu Hu, Chair of the Denison Music Department, for making this event possible for our German students and faculty (Gary Baker, Gabriele Dillmann, Jeffrey Frazier). Furthermore, I owe much gratitude to Tim, Denison’s amazing photographer, and Jamie Hale from University Communications for taking and then sharing the photographs below with me for this blog. But most of all a heartfelt Dankeschön to Ethel: Dorothy, Ralph (aka Frank), Kip and Corin!! As the organizer of this year’s Cultures and Languages across the Curriculum (CLAC) conference I would like to invite you to participate and engage with faculty and staff CLAC practitioners, from across and outside of the United States in this two-day, all-day event on our campus on April 16 and 17. 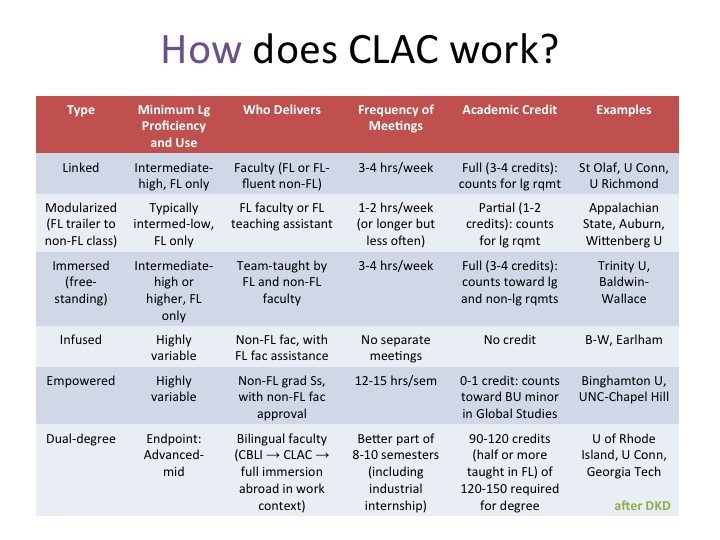 If you are interested in these ideas, the conference will be a rich source for learning more about CLAC theory, pedagogy, and the institutionalization and practice of CLAC concepts both from the perspective of CLAC teaching faculty as well as CLAC administrators. 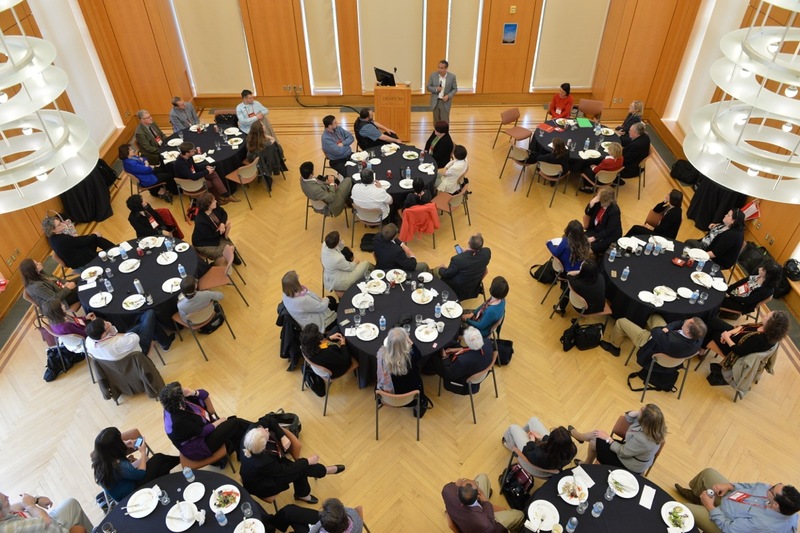 The conference spans over two days with all day long events such as plenary sessions, panels, keynote speakers plus two luncheons and a lovely dinner with entertainment from Denison’s amazing Denison Bluegrass Ensemble on the evening of the first conference day. Our keynote speakers are Adam Weinberg who will welcome our guests to campus and give the first keynote address, “The Internationalization of U.S. Higher Education: Reflections of a New College President,” at the luncheon on the first day, and Rosemary Feal, Executive Director Modern Languages Association, who will give her keynote address on “Language Trends, Trendy Languages: the MLA Perspective,” at the luncheon on the second day. I look forward to welcoming you to Denison in the spring! The theme of our conference is “Engaging a Wider Community through CLAC.” It focuses on building relationships to serve an expanded population. At this, our 9th conference, CLAC is reflecting on past achievements and planning future directions. 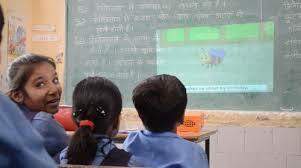 Currently there is increased national attention on and support for developing international and cross-cultural perspectives in the curriculum. Programs like 100K Strong in the Americas and Generation Study Abroad create even more opportunities to spotlight the role of CLAC principles/practices in shaping the next “generation of leaders who can reach across borders” whether physical, linguistic, cultural, or curricular. 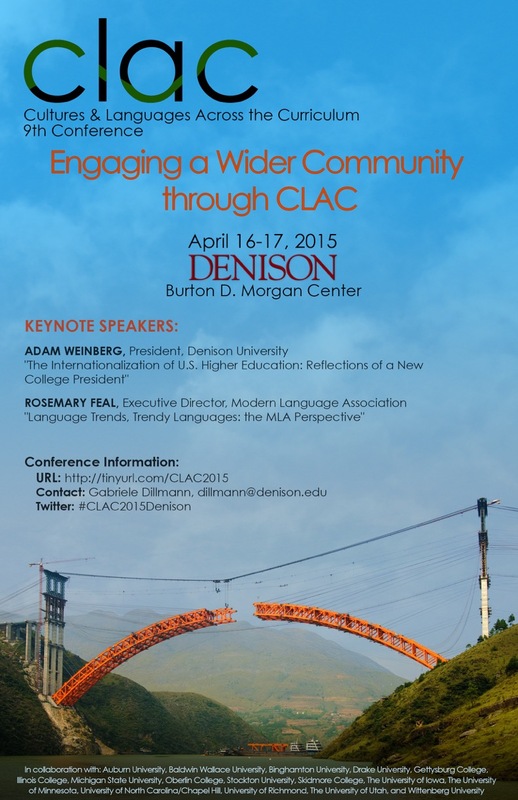 Please visit the CLAC conference website to learn more. We have already been able to attract two excellent keynote speakers for the conference: Rosemary Feal, Executive Director of the MLA, and Adam Weinberg, Denison’s new president (since 2013). Call for Proposals: You can find the CfP here with a link to the online submission form. The deadline for the calls is December 1st, 2014. Or scroll down to see the entire CfP. 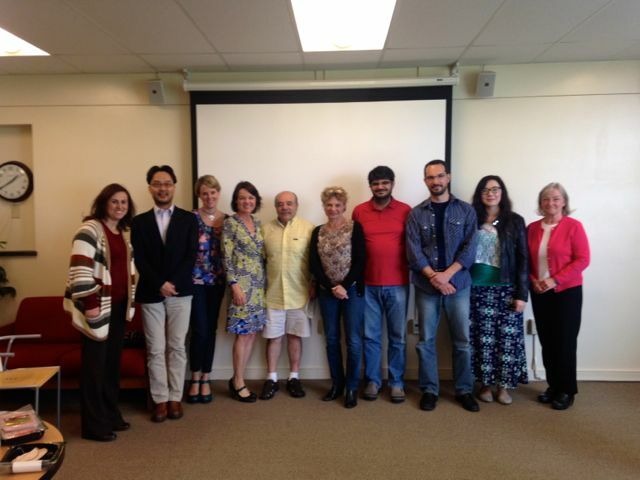 For more information on past CLAC conferences and the CLAC Consortium in general, please visit the consortium website. Our conference is of interest to both seasoned CLAC practitioners and those in the process of implementing or developing CLAC programs at their institutions. We seek a dialogue for sharing ideas and best practices in our evolving and unique field of education for global citizens. We welcome participation from the broad array of stakeholders promoting international education as a transformational model for learning, teaching and global engagement. Past participants at our conference have included academic teaching faculty and scholars, student affairs professionals, international educators, community representatives, government officials, and teachers. CLAC 2015 will provide an opportunity for more extended discussions of ways in which we can expand and advance the CLAC movement. An approach to language use and cross-cultural skills as a means for the achievement of global intellectual synthesis, in which students learn to combine and interpret knowledge produced in other languages and in other cultures. A list of technical needs. 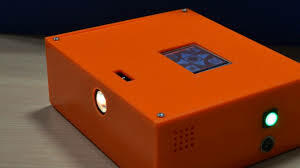 Note: Conference organizers will provide a data projector and screen for all presentations. 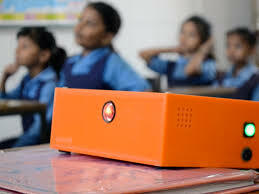 Presenters are asked to bring their own laptop computers. Note: The conference organizers welcome and encourage proposals for posters and for creative presentations that do not take the form of a traditional paper or panel. This might include videos, examples of CLAC assignments and exercises, or testimonials from student and faculty CLAC participants. Prospective presenters are particularly encouraged to consider a poster format because of the opportunity they provide for extended discussion and networking. For proposals of this variety, please submit the same information listed above.